Back in February I submitted my paperwork to extend my stay by reason of marriage, something I have done for the last five years. I received my 30 day "under consideration" stamp on the 12th of February. About a week ago, I got a phone call from immigration to say that they wanted me to get another document proving marriage in addition to the one I had already provided. I believe it's called "Kor Ror Song", never been asked for it in the five years before, always just provided a document from the Amphur showing we are still married in addition to our marriage certificate. Went in and gave them the document and thought everything was fine. Yesterday, the 13th, I got another phone call from them asking me how much I now had in my bank account and saying they want to see my bank book again, updated on the day and with another letter from the bank. I had already started using the money in the account after I got the 30 day approval so the balance was now below 400k. I went to the bank and deposited enough cash to bring the balance back up to 400k and also updated a second account that I had with around 70k in it and got letters from the bank for both accounts. 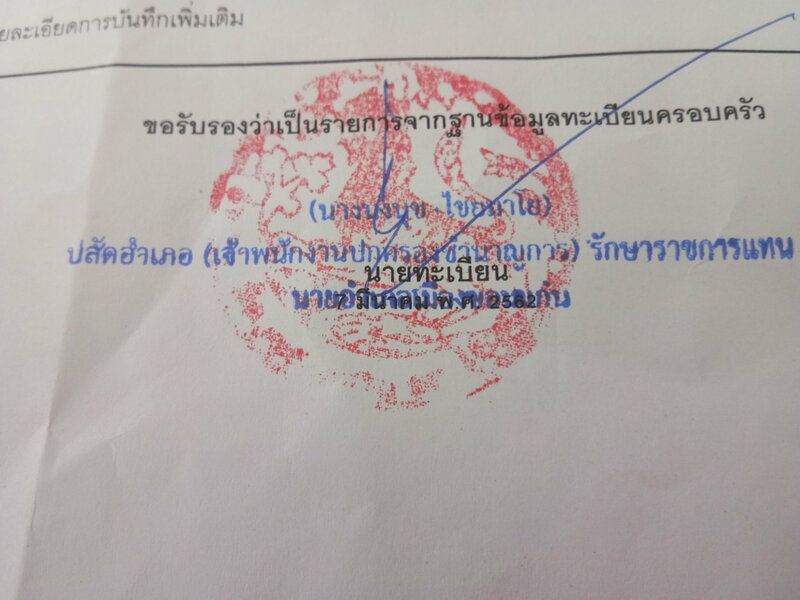 When I went to immigration with the updated passbooks there was a lot of shaking of heads and pointing to the fact that I had gone below 400k for a period of 10 days on my main account, the I/O refused to look at the other account, said they were only interested in the one I submitted with my application. They then told me it would be up to the "big boss" to say whether I would get my extension renewed or not. My 30 day approval is up tomorrow, the 15th so I'm wondering what are the options open to me if I get refused tomorrow, apart from "go home". I'm thinking that I can probably get a new non-o visa based on marriage and start the application all over again but I'm wondering if as a stop-gap measure I can go out and back in again at a land border, coming back on a tourist visa? The reason for asking this is that we (me, the wife, kids and grandchildren) have got tickets to the superbikes this weekend and so if I do have to leave on Friday I'm looking for a quick way back in, preferably through somewhere near to Buri Ram. You can get 60 days extension to visit your wife. I also got a phone call to supply a recent one rather than the 3 year old one I submitted at the application. That means they are actually looking at the applications. Late (vs checking this at the time they accept paperwork), but they are looking at them. I get new documents each year so nothing to do with it not being a recent document, first time they've ever asked me for the Kor Ror 2 so definitely the recent one, interestingly enough, they initially claimed I had submitted an old one and when we got them the document I noticed that there was no date anywhere on it to show whether it was issued recently or not. Are you sure it does not have this signed and dated stamp on it. All of them my wife has gotten have had one on it. Yes, you're right, there is a date on it, I hadn't noticed it as it's covered by the stamp, can just make it out if you look closely enough. Lot easier to see in this picture than it is on the actual document. The natives are restless about our financials and visa agents. Been going on for months. Plastered all over the internet/media. In Bangkok, I was specifically asked for an updated KR2 whereas before I was actually told the first was only necessary. Yes, after calling me back for the KR2 last week they called me back yesterday and asked to see the updated bank book (yesterday was day 28 of the 30 day mark). I was below the 400k mark but bumped it back up (plus had another account) but they were only interested in the fact that it had dropped below 400k. Strange thing about the KR2 was that when I took it to them, the I/O just looked and grunted. Asked him if he wanted a photo-copy said no, asked if he wanted me to sign it, said no, but they had asked me to sign every other document that I submitted, both original and copies. Took copies of the updated bank book yesterday and asked me to sign them so no idea why they didn't want a signature on the KR2. Did you not know that checks were being made during the 30 Day under consideration period??? Did you not know that check were being made during the 30 under consideration period??? No, never happened to me in the previous 5 years. Forget the previous five years, we're talking about now and the series of events that has taken place over the last five months. Have you been keeping up or are you not aware of what has been happening?